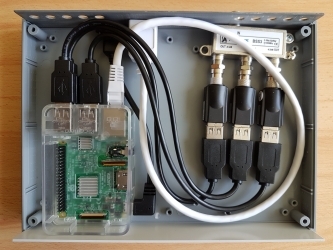 The server consists of a Raspberry Pi 3 computer with a 16GB micro SD card, a 3-way antenna splitter and three Media-Tech MT4171 DVB-T tuners. A TV splitter splits the signal from a TV antenna and passes it to individual TV tuners. The n-way splitter can split the signal to n tuners, and each of them can be tuned to one multiplex/frequency. Each multiplex contains several TV channels. 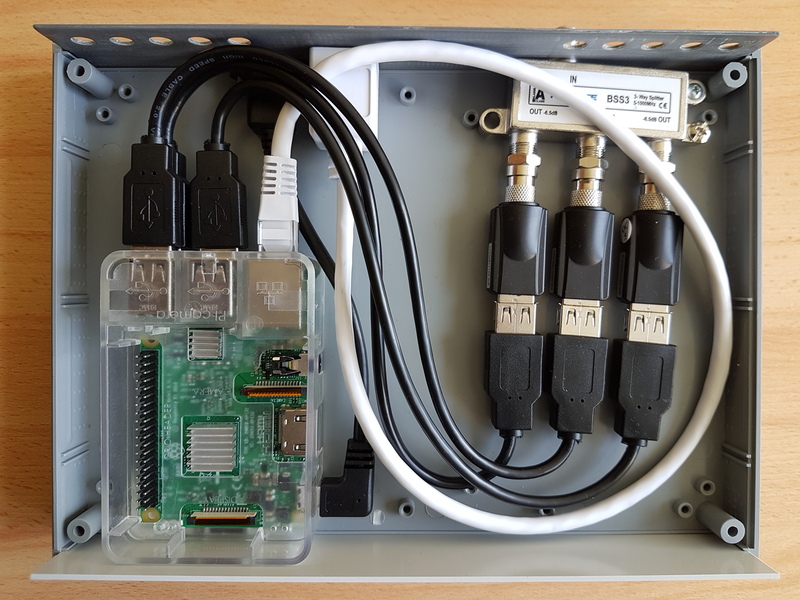 Then a stream from TV tuner is passed to a Raspberry Pi computer with Tvheadend TV server software installed. Finally Raspberry Pi streams TV to users connected by a computer network. The larger enclosure is big enough to accommodate a 4-way splitter. Unfortunately, we did not find any RoHS compliant 4-way splitter, so we used a 3-way splitter. There are also thicker versions of Gainta G715 case (G716 and G717) which can accommodate 6 and 8-way splitters. Using a 3-way splitter means that 3 people can watch TV at the same time by selecting any channels from all multiplexes. Each subsequent person must select a channel from the multiplexes already selected by the first 3 people, since each tuner is already tuned to a certain frequency of a multiplex. We used Media-tech MT4171 tuners suitable for all types of DVB-T streams. If terrestrial television is broadcast in a different standard, i.e. 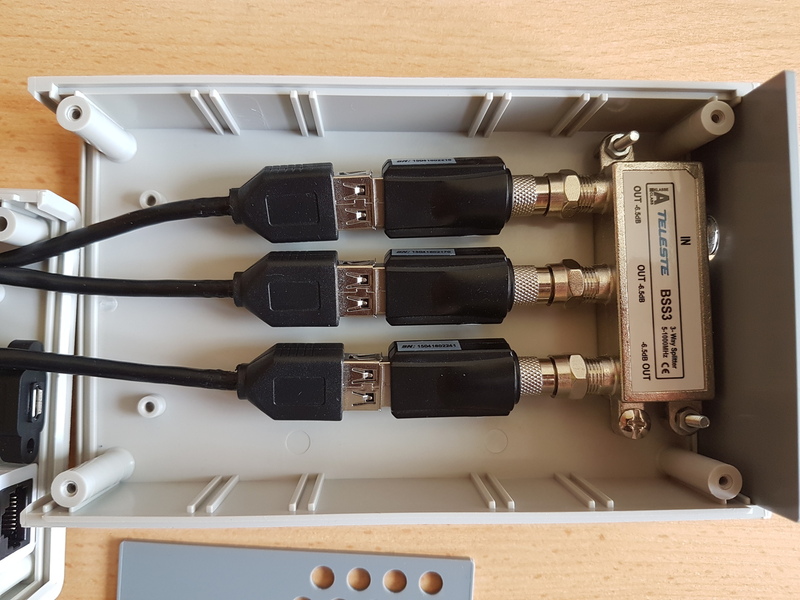 DVB-T2, ATSC or ISDB-T, then other tuners should be used. Because DVB-T H.264 HD stream has 6-7 Mb/s bandwidth, the server cannot stream more than about 16 DVB-T H.264 HD transmissions due to 100 Mb/s Ethernet port used in Raspberry Pi 3. Likewise, we can calculate limits for H.262, H.265 compressions and DVB-T2, ATSC, ISDB-T standards. It is important to use Raspberry Pi 3 rather than Raspberry Pi 1. 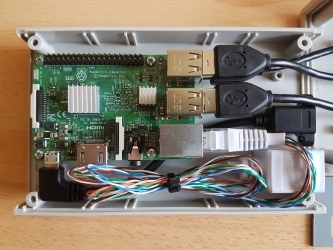 Raspberry Pi 1 can hardly stream HD TV to 2-3 users simultaneously. On the other hand, several months of tests have shown that Raspberry Pi 3 is able to stream HD TV channels seamlessly to at least 4 users. It seems that Raspberry Pi 3 can send HD TV streams simultaneously to 15 users, although this test was done only for one hour. We like the fact that all components are enclosed in one case. We think both enclosures are suitable for other Raspberry Pi projects. 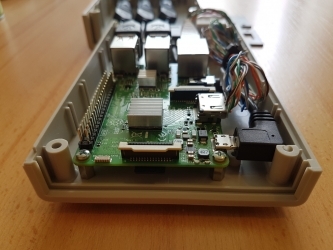 Their advantage over existing Raspberry Pi enclosures is that they can accommodate both Raspberry Pi and additional devices connected to the Raspberry Pi via USB. Installation and configuration steps made during manufacturing of the server are shown below. Start Raspberry Pi and execute the below commands/steps. Set initial passwords. #Change the default password for security reasons! - Access control                         #add "tvuser1-.."
- Networks:                            #define a "TV network"